Brigette is the face of Parry & Pfau. She's the first person you see when you walk through the door, and the last person you see before you leave. And you'll be glad she is. You're day will be better because of her. 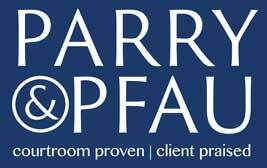 Brigette is now Parry & Pfau's official legalese interpreter. "Brigette is the kind of person who can brighten anyone's day with a smile. For many clients, Brigette is the first person they meet at Parry & Pfau, and Brigette's interactions with them enhance their experience and do us proud."